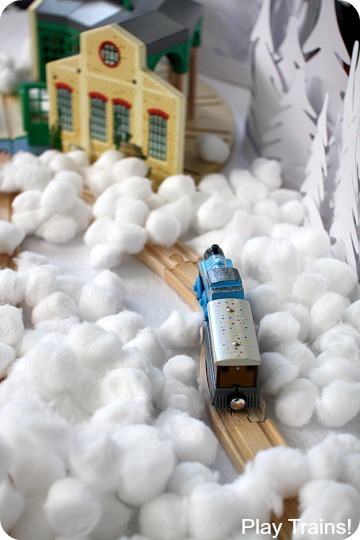 I’m glad that there are a few children’s books about trains in the snow that focus on winter rather than the holidays. Not that the Little Engineer minds reading books out of season, but it’s nice that there are a few stories that are set in winter without Christmas coming into the picture. 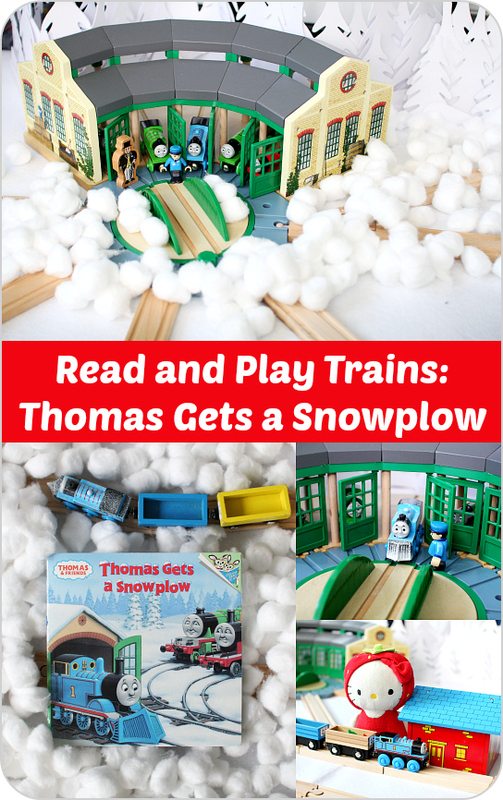 Thomas Gets a Snowplow is one that we’ve read many times, and there are parts of the story that are really fun to play out. On this particular occasion, we had a great time planning and building a layout to recreate the full story from the book. I was excited to see that some of the storytelling concepts I had been introducing to the Little Engineer had really started to sink in. 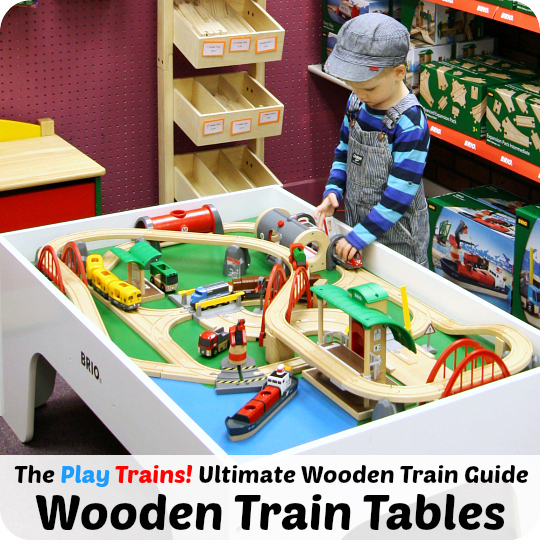 Below you’ll find both tips on how to bring this particular book to life with wooden trains and ideas for playing out any book with wooden trains. 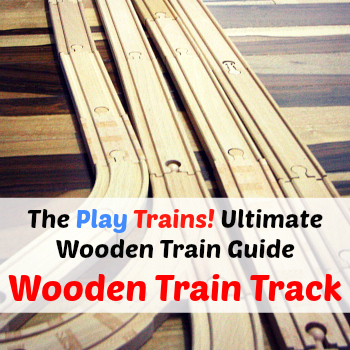 We had a lot of fun with this one, and you may enjoy sharing the photos with your young train enthusiast. An earlier version of this post was originally published on February 18, 2013, when the Little Engineer was three years old. It contains links to Amazon.com. If you click on one, we will receive a small commission — at no additional cost to you — on anything you buy at Amazon for a certain length of time afterwards. Read our disclosure policy for more details. After reading the book a couple of times over breakfast, I asked the Little Engineer if he would like to help me make some lists to plan what we were going to do. He was enthusiastic about the idea, so we started right away. I came up with four categories of information that would be useful for our project: Characters, Places and Scenery, Props, and Plot Elements. Being a writer, I try to share my love of the craft of storytelling with him. So he’s familiar with most of those concepts at this point, but I explained them to him again anyway. Then we went through the book, page by page. As we looked at each page, I asked him if there was anything to add to our lists. I found it helped to prompt him with the individual categories: “Do you see any new characters on this page to add to our list?” or “What’s different about the Sheds from how they usually look?” (The snow.) It was interesting to see how much more confident he was with identifying characters and plot elements we needed to write down. I usually had to guide him to discover the new locations and objects. I’ve focused more on character and plot than on setting when talking to him about books and what I do as a writer. That showed me both that all that talking was probably making an impression, and that I should talk about setting more often. One thing that really delighted me was that as we listed characters, he started casting the non-engine roles, as if this were going to be a play. He, of course, was to play Thomas’ Driver (I talked him into using a little engine driver figure by pointing out he could use it to represent himself in the layout). He wanted his best friends, Meekat and Strawberry Kitty, to be the innkeeper and the general store owner respectively. Once we had our lists completed, we started to build the layout. 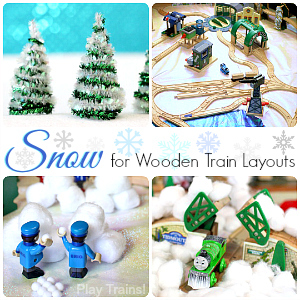 We used a number of the tricks I shared in Seven Ideas for Bringing Snow into Train Play to create our wintery scene. 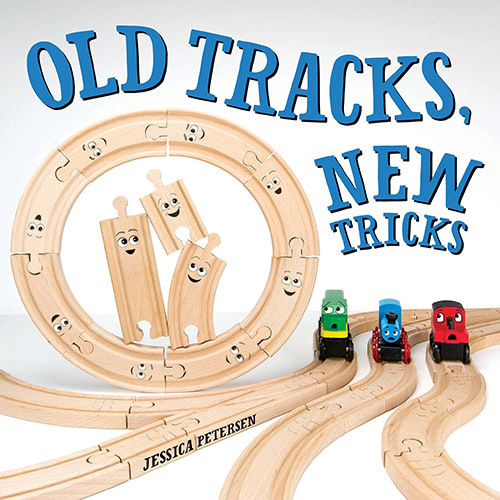 There are only a few different locations in the book, so mostly we had fun building with some new, unusual track we’d ordered from Meskotoys. All we really needed were a roundhouse, an inn, a store, and lots of winding track. So when we had everything connected up, we started to play. While we had fun adding props and scenery, remember that all children really need to play out a story from a book is their imaginations. 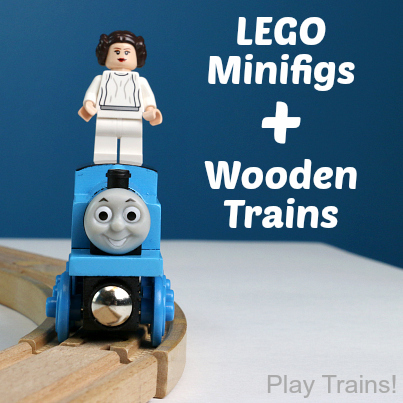 In light of that, even a single wooden train is optional! You can take even one or two elements from what you see below and add them to train play, or come up with something completely your own. I’ll share what we did and some ideas for alternatives below, but nothing is necessary. 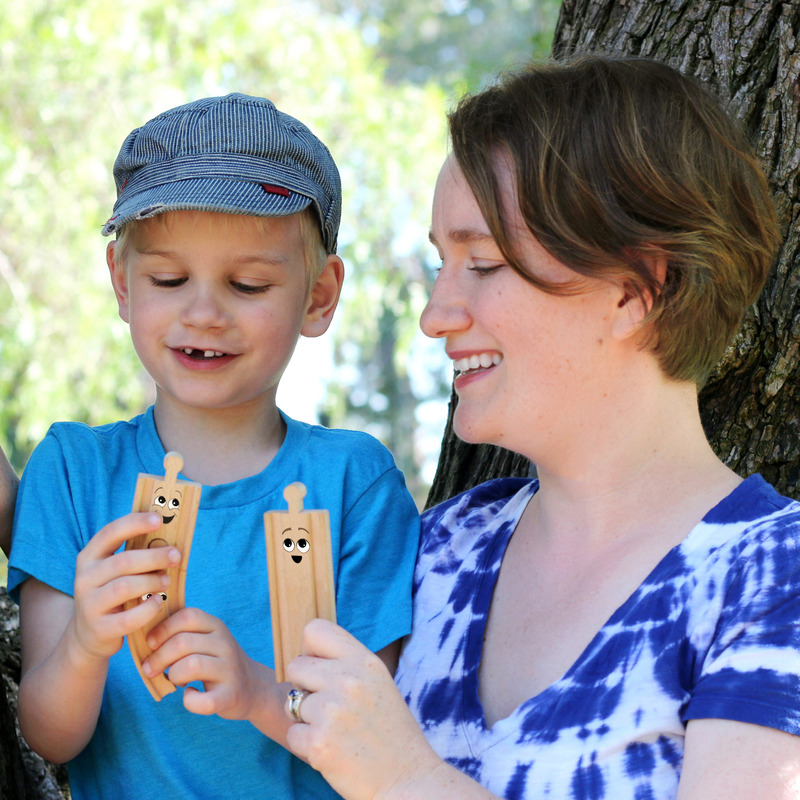 The idea here is to come up with a way to tell the story together that is meaningful to your child and fun for everyone involved. I’ve bolded the lines that give the context from the story below each photo, in case you’d like to look through the photos with your child and tell the story based on them. The story begins with Thomas’ driver commenting that they’ll need the snowplow soon. Thomas really doesn’t want to wear it. When his driver asks why not, Thomas confides that he doesn’t want the other engines to laugh. (When the Little Engineer was younger, I changed the reason to the snowplow being heavy and uncomfortable.) Train play notes: much of this story takes place at Tidmouth Sheds, a familiar location to any fan of the Thomas & Friends series. We have the official version, but any train shed, arrangement of track, or even a drawing on a piece of paper to set engines on will do. 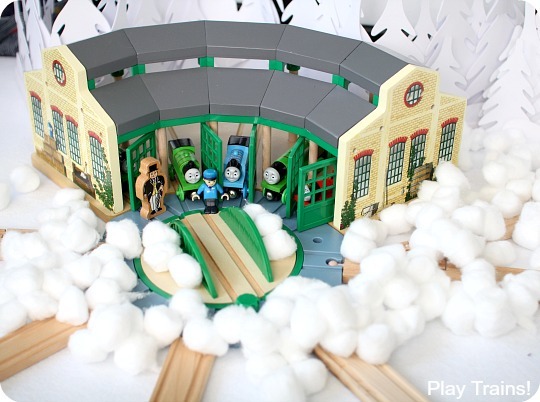 For an easy, DIY recycled engine shed that could be used here, check out our Dryer Sheet Box Engine Shed. 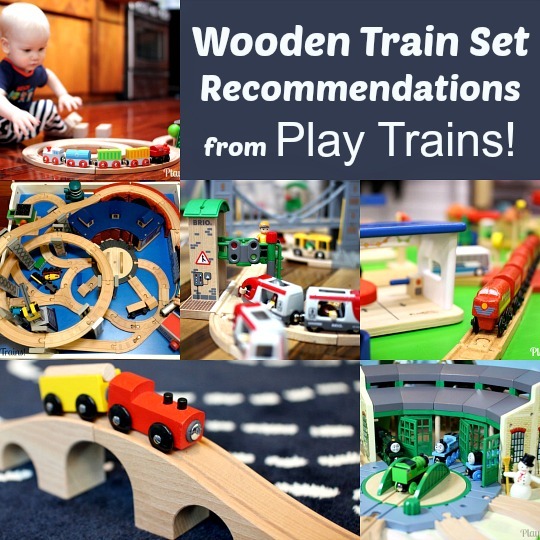 You also may be interested in our recommendations for roundhouses and engine sheds from our Ultimate Wooden Train Guide. 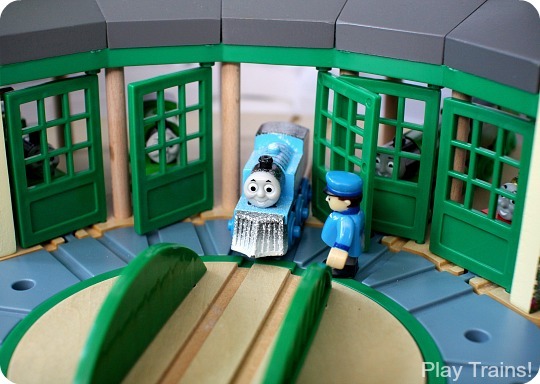 Thomas’ driver is played by a Brio engineer, which can be found in the Brio Travel Train sets. Because it isn’t snowing right then, Thomas’ driver agrees to let him leave it off for now, but insists that they try it on to make sure it’s still in working order. Train play notes: Obviously, it’s fun to have a Winter Wonderland Thomas with a snowplow to play out this book, but it’s not necessary. 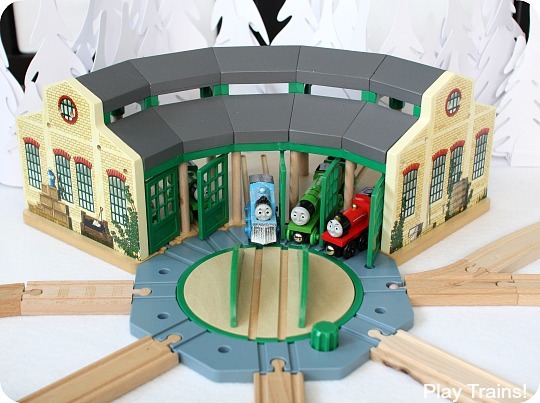 It might be a fun project to try to make your own snowplow to attach to a regular Thomas. (Might I suggest some residue-free duct tape to attach it?) Or, if you’re lucky enough to have access to a 3D printer, my husband designed a wooden train snowplow that fits over the engine’s front magnet that can be printed in plastic. It does not fit all of the Thomas & Friends engines due to their varying designed, but it generally works for Thomas himself. 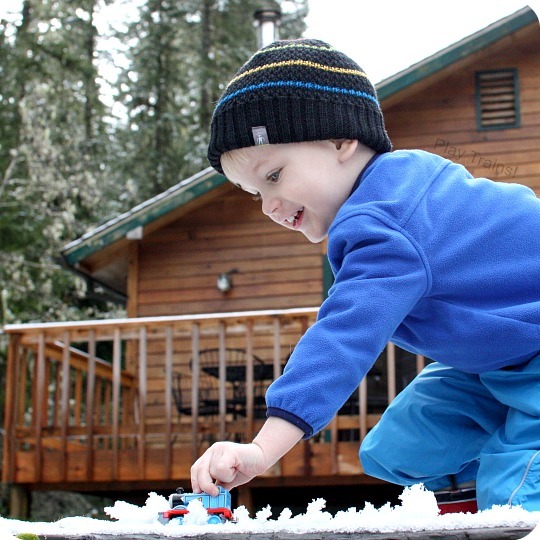 While Thomas is trying the snowplow on, James and Henry come out and tease him. (When I read this part, I change “‘Ha! Look, Henry,’ said James. 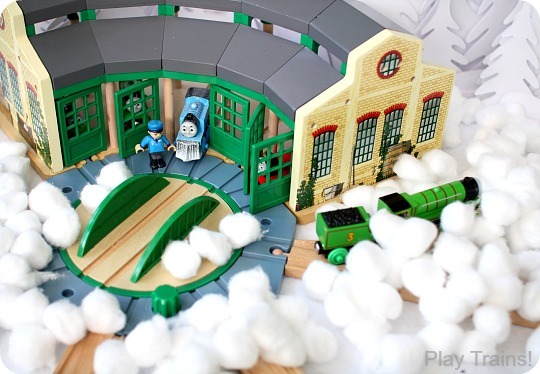 “Thomas is wearing a snowplow! It looks like a tin can! '” to “‘Look, Henry,’ said James. ‘Thomas is wearing a snowplow. '” I also omit the line, “The two engines chuckled and chortled,” and read Henry’s dialog line with a little less of an insulting tone than the italics and exclamation points suggest.) Thomas then whispers to his driver a quiet plea to take it off, and his driver agrees. This is a touching moment, especially considering it’s so rare to see the drivers being emotionally sensitive to the engines. Thomas chuffs off to run his errands. 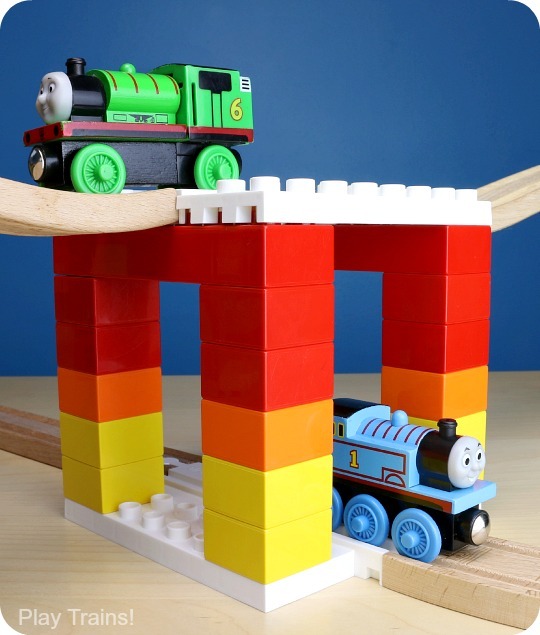 The Little Engineer was really excited about getting to this part because he wanted to go under that bridge. I think he liked the combination of it and the long, straight track. Train play notes: I cut little blanket, mitten, and hat shapes out of craft felt for Thomas to deliver. The one thing we didn’t have from the book was a snow shovel. I would’ve liked to use a Duplo shovel we have, but I had no idea where it was, and the Little Engineer was impatient to start playing. Meerkat the Innkeeper received the extra winter blankets for his guests at the inn. Train play notes: these particular freight cars came out of Imaginarium wooden train sets (exclusive to Toys’R’Us), with the addition of our DIY Troublesome Truck Face Stickers to give them personality. Strawberry Kitty came out to get the mittens and winter hats for her general store. 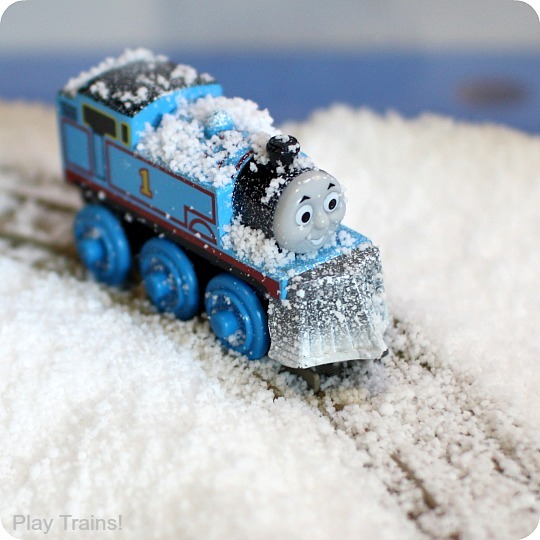 Next, the Little Engineer was in charge of making it snow on the Island of Sodor. We talked about how it needed to be a lot of snow to go with what happens in the book, and I had a couple of bags of cotton balls to had him at this moment. 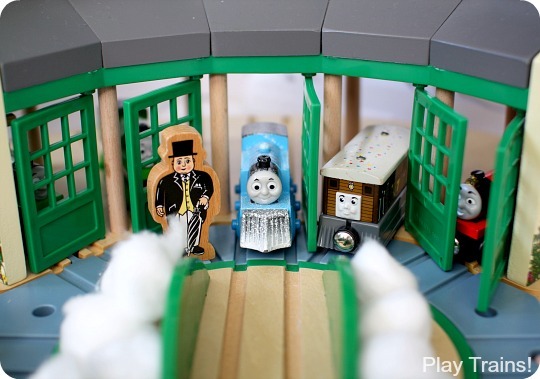 Thomas makes it back to the shed without his snowplow. He feels like he’s proved that he doesn’t need it. 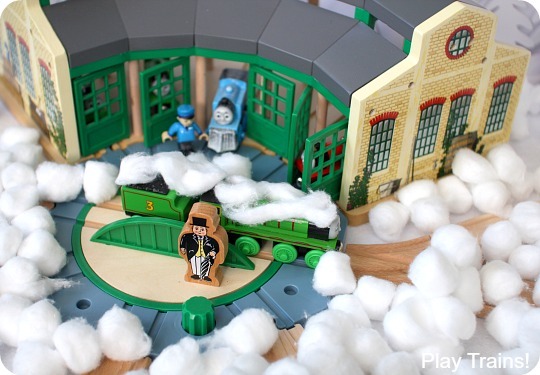 Back at the sheds, the engines are talking about what a heavy snowfall it is when Sir Topham Hatt arrives. He informs them that Toby is snowed in on his Branch Line and insists that Henry go and rescue him because he’s the largest engine there. 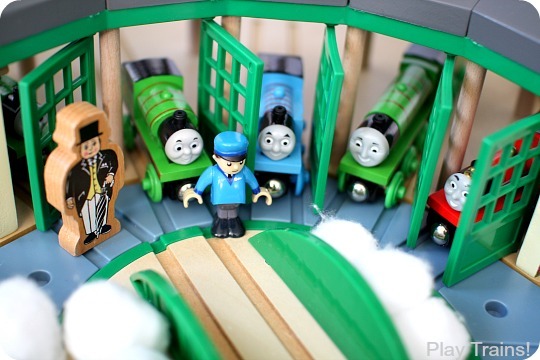 Henry tries to get out of it, but one look from Sir Topham changes his mind. 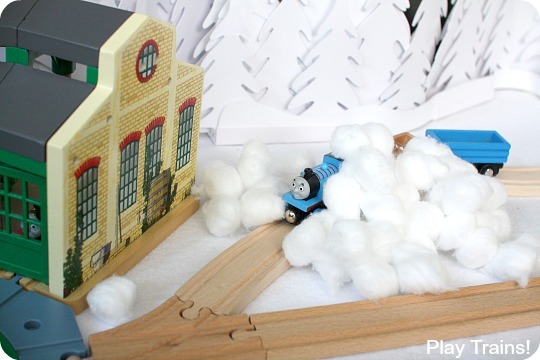 As Henry and Sir Topham go off in search of Toby, Thomas’ driver decides to put Thomas’ snowplow on due to a “bad feeling about this snow.” Henry backs all the way back to the shed, covered in snow. He couldn’t manage it without a snowplow. Thomas decides to volunteer to save Toby, despite the way the other engines had mocked him before. 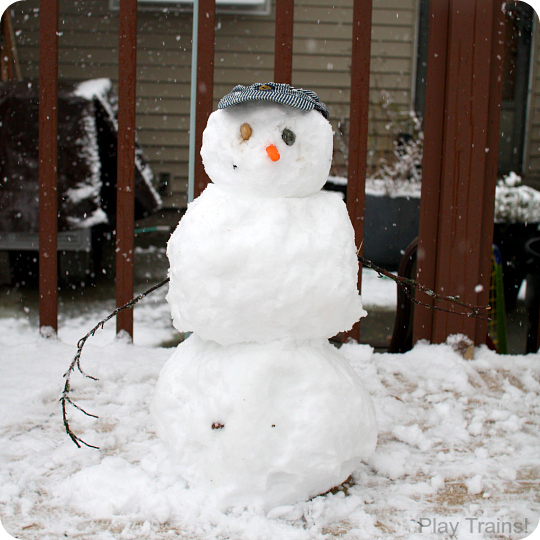 Here’s “Poor Toby,” as the Little Engineer always calls him in this situation, covered in cotton ball snow. It’s sort of a game the Little Engineer came up with last winter after reading this book, which usually involves me covering Toby in cotton balls and him driving Thomas out to rescue him, over and over. We only did it once this time around, in order to move on with the story. 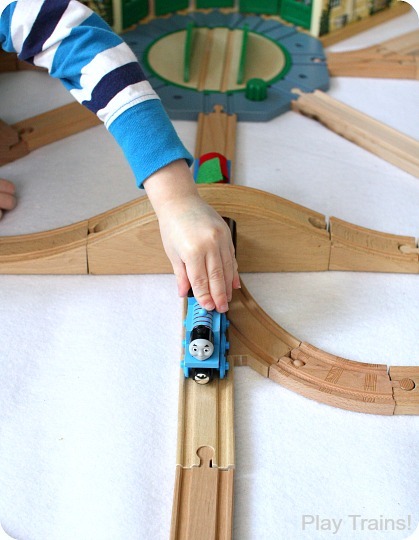 Thomas cautiously plows his way out to Toby. The Little Engineer enjoyed clearing the tracks, as he usually does when we play “Poor Toby.” And then Thomas pulls Toby back to the sheds. 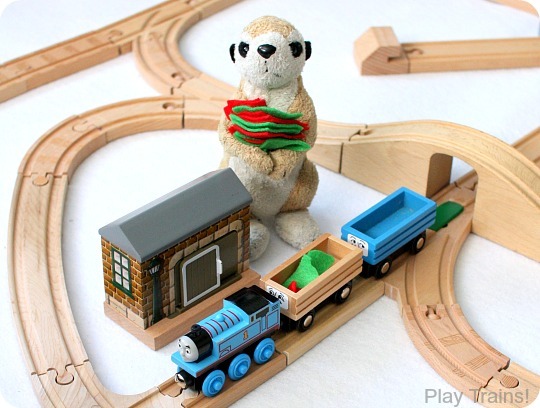 Toby thanks Thomas for saving him, and wishes he could have a snowplow, too. (His cowcatcher won’t allow one to fit.) 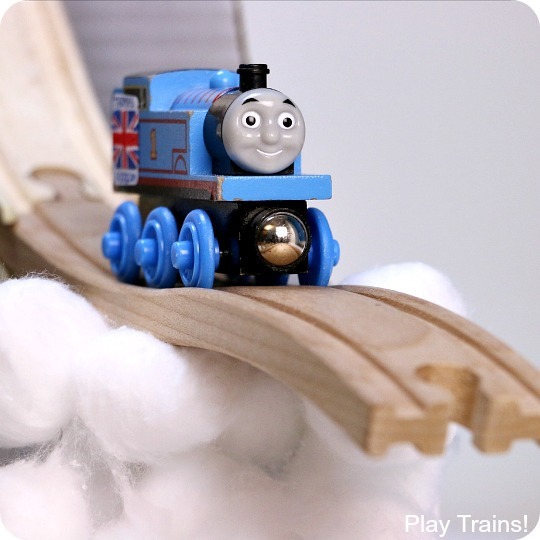 Sir Topham pronounces Thomas “a Really Useful Engine, and … a hero as well.” Thomas Gets a Snowplow was a fun story to act out with our trains, and it was nice to do one a little less complicated than our retelling of Valentine’s Day in Vicarstown. 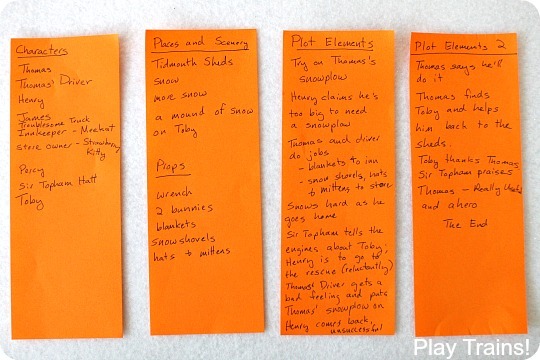 By the end of the whole project, which only took an hour or two, the Little Engineer knew the story backwards and forwards, and he definitely had strengthened his understanding of storytelling concepts through the planning process. 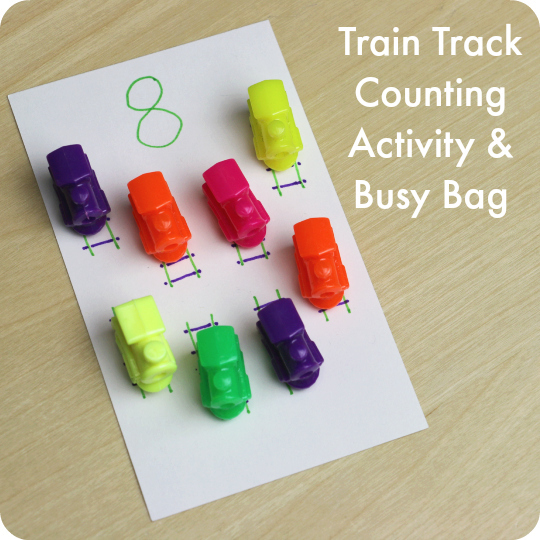 I’m looking forward to the next time we bring a train book to life with our toys. How fun. 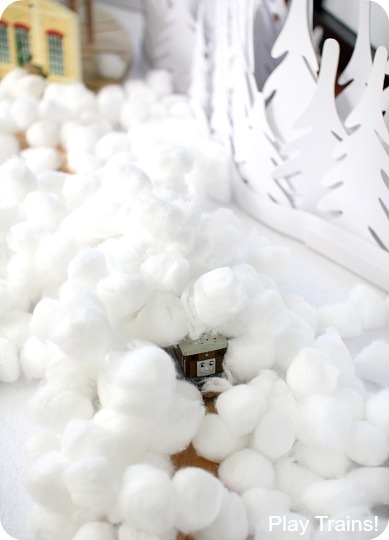 We love using cotton balls for snow too. I love that it is a safe (and quiet) way to have a snowball fight. 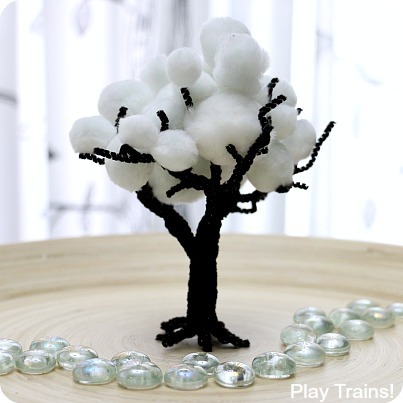 That’s a great idea for the cotton balls. I’ll have to do that with the Little Engineer, since he hasn’t had the opportunity to throw a snowball yet, poor guy. I love the brainstorming your did! I love that he came up with characters. I will be pinning this post and sharing it on Facebook. Thanks! I really loved it when he cast the characters…it’s so fun when they surprise you. What a wonderful idea! I love that you brainstormed and organized it all first. Thank you for sharing at Sharing Saturday!! Thanks! The more times we do this, the more fun (and detailed) the brainstorming becomes for both of us. Wow, thanks! I’ll definitely be coming by this week. What a fun way to retell the story! I love reenacting the story activities. Lots of great tips: thank you for sharing!